I went to Equine Affaire both Friday and Saturday, in part to do some shopping and to enjoy the variety of horses, but mostly for the Jan Ebeling clinics. Jan Ebeling is a Germany native turned US Citizen, who rode Ralfalca (Ann Romney’s horse) in the 2012 Olympics. The clinics were supposed to cover several topics and range from training level to grand prix. I thought I would learn a lot and be inspired to ride. This was not the case. Overall, I was disappointed in the clinics. There were 4 altogether, and each one was supposed to have a different topic. But he had the same horses and riders in each clinic and they went over the same things. With the exception of one horse and rider, which were showing at 2nd level (and a training level horse which I missed), all the horses were at least at Prix St. George. They performed most of the movements flawlessly, so it was fun to watch, but not good for learning. On the heels of watching all these perfect gorgeous horses and a terrible ride on Savy Friday night, I’m feeling deflated. Training can be so difficult, and Savy is very challenging. It seems nearly impossible for me to get her on the bit. For my non-horsey friends, being on the bit refers to a way of moving for the horse. The horse is supposed to engage their hindquarters to create energy, and rather than just going faster, the energy should be used to increase suspension and impulsion in the gaits. The horse should look balanced, floaty and have their neck arched, accepting contact with the bit. 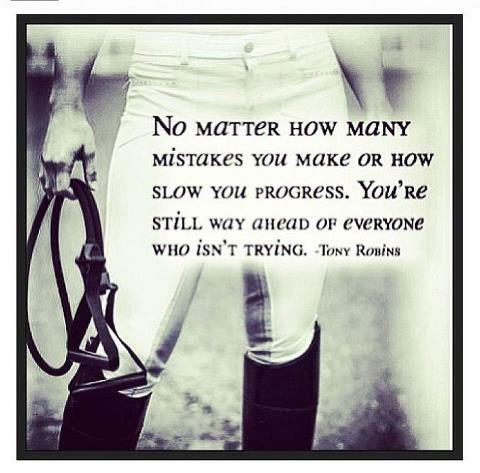 This is the very first step in training for dressage. If the horse is not able to be on the bit, they will not be able to do any of the more advanced movements, and will not move past training level. If Savy accepts contact with the bit, she will not move forward enough, if she moves forward, she will not accept contact with the bit. To be on the bit she needs to be doing both. I’m really frustrated because we’ve been working on this since October and it’s not getting any easier or better. At this point we seem to be regressing. We have a show on Sunday and I’m worried it’s going to be a complete disaster. We are having two lessons this weekend to try and pull ourselves together. Hopefully we can get some consistancy on the bit, and we can stop riding around with Savy’s head straight up in the air.